Laurence Edlin Mears (known as Larry) was born in 1893 at 23 Casthorpe Road, Barrowby. His father Edlin was a labourer in an iron foundry. Laurence and his twin sister Grace Phoebe were the youngest of 7 children. By the time they were 7 the family had moved to 78 Brewery Hill, Grantham. Laurence worked as a gardener, working for Colonel Parker for 4 years before moving to the gardens at Belton House. He was a keen campanologist and a member of the St Wulthrams Society of Bell Ringers. At the outbreak of the Great War he joined 6th Battalion Lincolnshire Regiment. His first posting must have been very familiar as the battalion was encamped in Belton Park. On 1 Jul 1915 they sailed from Liverpool to Alexandria. 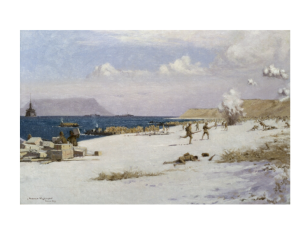 Then via Mudros to Cape Helles on the Gallipoli peninsula. After 11 days ashore they were withdrawn for a landing further up the coast at Suvla Bay on the night of 6/7th August. On the afternoon of 7th they captured Chocolate Hill at Yilghin Bumu in a bayonet charge. Laurence was shot in the head this day and is commemorated on the Helles Memorial, as well as on the Belton and Spitalgate War Memorials. 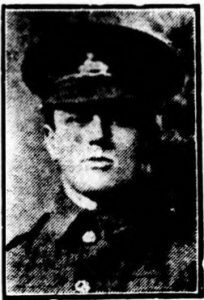 Charles Frederick Saxelby was also in 6th Lincolnshires and died at Suvla Bay 2 days later. Laurence’s father Edlin Mears became a packer in an agricultural implement works and remained in the Grantham area until his death in 1931. In 1911 Laurence’s twin sister Grace (17) was working as a nursemaid at Yule House in Oakham. She married Ernest Watson in 1919.